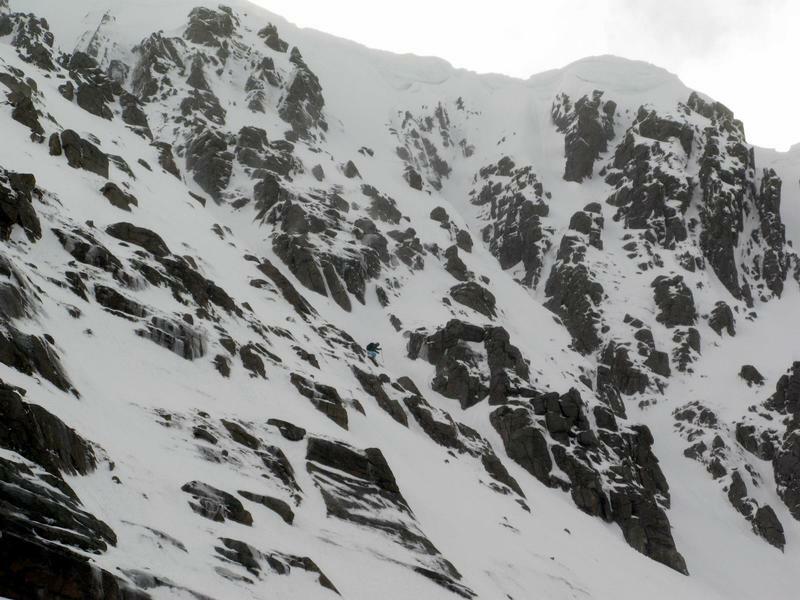 Coire an t-Sneachda is almost certainly one of the most popular gully skiing locations in Scotland due to the proximity to the Cairngorm ski area. It's also a contender for the most popular winter climbing area in Scotland as well, and as a result, it can be very busy in the gullies! The best time to ski the lines are late in the season when the corrie is quieter, or late in the day to avoid the majority of the crowds. Easy options into the corrie include the west facing descent from Windy Col (at NH998036), or "0.5 Gully", a shallow northeast facing gully between the head of the col above the Goat Track, and Fiacaill Buttress on Cairn Lochan at NH990028. The slope taken by the Goat Track can also give a good short descent in the right conditions, and is steeper than nearby "0.5 Gully". Amongst the easiest described on this site! Either head up through the ski area and onto Fiacaill a' Choire Chais and round the top of the corrie, or from the ski car park, follow the well made path round into Coire an t-Sneachda. If returning from skiing elsewhere, such as in the Loch Avon basin, you can sneak an extra descent in on the way back in the corrie. There is one relevant Scottish Avalanche Information Service forecast for Cairngorm: Coire an t-Sneachda. Whereas not quite as popular as Aladdin's Couloir, the straight chute of Jacob's Ladder does receive a lot of descents. Not only has it been straightlined, rumour has it that it has been skied naked! The top can often be very steep, and sometimes an abseil is necessary, and the lower section is narrow. Notes: Can be quite steep for Grade I at the top. Possibly the most popular gully in the most popular corrie for skiing East of the A9? In good conditions, this gully is a fine descent. The entry to the top of the gully is unusual in that there is a small col below the cornice, known as "Aladdin's Seat". The cornice is usually easiest on skiers left. From the col, skiers right is Aladdin's Couloir; skiers left is Aladdin's Mirror. The descent to the col should not be underestimated, as a fall down Alladin's Mirror would have serious consequences. Once in the gully, it is a straightforward descent as the gully bends round to the left. In very lean conditions, a short easy angled ice pitch forms here, but you wouldn't be skiing it in these conditions anyway. Notes: Straighforward once on the col.
Aladdin's Mirror, as the name suggests, mirrors the popular Aladdin's Couloir. Although the line starts and finishes in short gullies, Aladdin's Mirror is more of a face descent, with associated risks of cliffs to avoid falling over. When in condition, this route is exciting, atmospheric and well worth hitting as a more advanced option instead of Aladdin's Couloir; when out of, or in bad condition, the route can be anything from harrowing and awful to a series of barely-climbable rock-slabs with patches of snow between them. 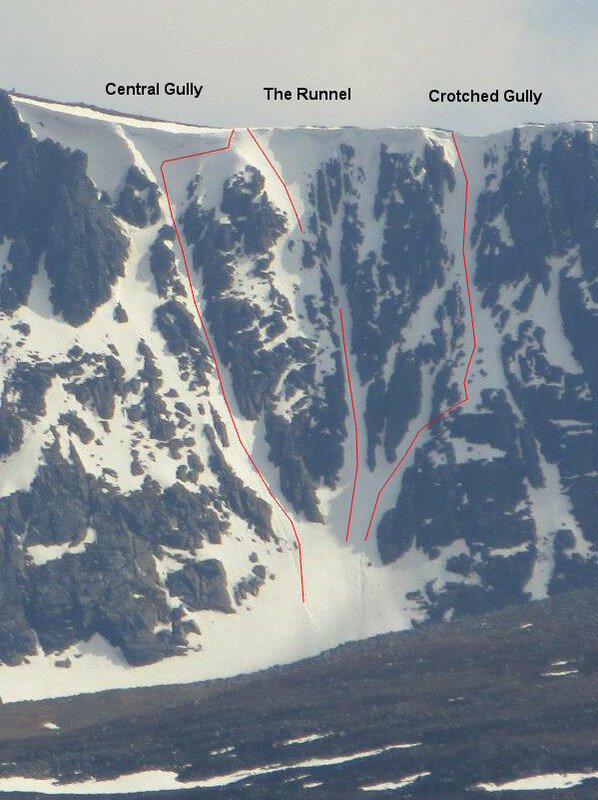 Unlike many Cairngorm steeps, this route has the dubious features of a convex slope to enter, meaning that one cannot see how steep it gets until one is thoroughly committed, and an ice-fall in the direct line below. This ice-fall ("Aladdin's Mirror Direct" to the climbing world) has been jumped on skis/boards, but in most conditions it would be suicidal, varying in height from 5 metres in a heavy snow year (such as 2010), to nearly 25 metres, with vertical walls on both sides of the landing. The difficulty of circumnavigating the direct line varies massively - either the mirror will be a broad snow-slope skiers left of the entrance from Aladdin's Seat (the rock pinnacle at the top of Aladdin's Couloir, from which the Mirror descends to the left), or in leaner conditions the departure from the direct route may be a more pronounced crossing of a vertical band of rock, hopefully punctuated by snow, and onto snow beyond. Following that snow-slope round and down to the foot of the ice-fall will the lead the skier to open ground below. Central Gully is the leftmost of the "Trident Gullies"; a long chimney line that sometimes attains skiable width. The most notable narrow section is about 50m down from the top, and clearly visible from the cornice above. In soft snow, the steep and shady aspects of the line made for fine steep skiing, but the narrowness of the route lends itself only to jump-turns. Entrance from the top in skiable conditions is from the snow-ridge that forms between the Runnel and Central Gully. From there, an intimidating traverse skiers right is required above some rocks (no fall zone), across a snow arete below the cornice and into the line of the gully itself. From this point, the way to the bottom will be obvious.. Depending upon build up, there may be sections in it narrower than the length of your skis! The Runnel is the middle prong of the "Trident Gullies", and is the most defined of the three. The top of the gully is a steep rocky/icy chimney which can be viewed from above, and is avoided by starting skiers right of this, very near the entry point into Central Gully if the cornices allow.. The upper section is on open ground heading diagonally down towards the main gully line, and can feel quite exposed. This is definitely a no-fall zone. Finding a way into the gully below the chimney will depend on the build up of snow. In a reasonable snow year, you should be able to find a way to slide in about a third of the way down between a couple of rocks, but otherwise a short drop of a few feet may be necessary at a suitable point. Once in the main gully line, it's a similar descent to Central Gully. Notes: The grade applies to the narrow chimney at the top of the route, but the skiers entrance is still steeper than your average grade I. The cornice can be sizeable, and it is a very steep entrance into the gully, but the angle soon relents. Approximately two-thirds of the way down is potentially the crux of the descent. 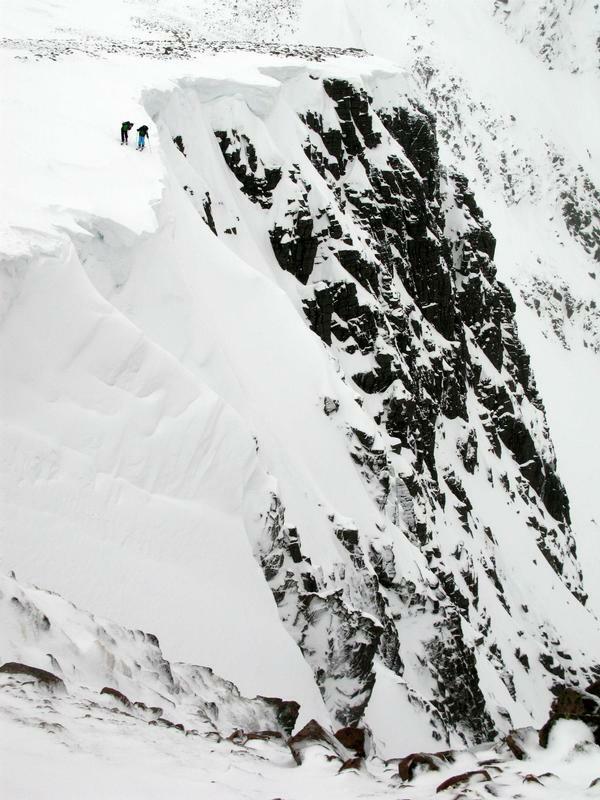 In ascent, climbers normally take the short icy groove on your right (their left), but this would be problematical to ski. The alternative is to descent to skiers left for a short distance before you can cut right and find an entry to the gully below. This entry may be a short slide on very steep snow in good conditions, or late season, a reasonable drop, which depending upon build up could be 3/4/5m. The wide gully below is straightforward.